It's coming up for planting season so I've put together a brand-spanking new allotment plan for 2014. I'm not entirely convinced that I'll get everything planted in this drawing (strawberries are looking unlikely due to the perennial weeds creeping up) but it's a rough guide for this year. Due to Spring being more punctual this year I managed to get 50 broad bean seeds sown of the Witkiem variety in the new large bed. I don't think I have planted this many broad beans before so it will be an experiment. I've also got Sarpo Mira spuds again as they were pretty good in 2012 and had a lovely flavour (plus they're not prone to blight). They are currently 'chitting' by the lounge window at home. I've also got 3 varieties of courgette as they always seem to do so well. I've got ball, yellow and regular courgette seeds. I've also got butternut squash seeds that need to be planted so I'll be sticking those in wherever they will fit. They tend to sprawl anyway so I'm happy for them to do that. I haven't decided on the mange tout or other beans seeds yet but I have some leftovers from last year so I'll probably finish those off. I've also gone for a new logo for The Dig Issue - a rather playful typeface called Festivo that reflects my chaotic gardening style! I've also used the typeface for my new plan below. 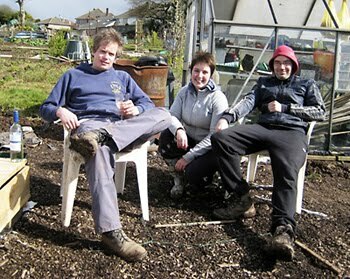 Hi Nicole, great to meet you on Tuesday and nice to catch up with your allotment blog!